As the year comes to a close, I’d like to thank you all for reading our blog. I hope you’ve taken away useful information about antiques and vintage furniture. I’m grateful to all our customers who shared their photos with us (and with you!) to provide home decorating inspiration to everyone who visits this page or subscribes to the blog by email. I’d also like to thank all of our Facebook fans who like, share, and comment on items we post there. It’s fun to get your feedback. And remember: You can post your home decor photos directly to our Facebook page, too! In the spirit of new beginnings, I’d like to take a look back at ours (and your) 12 favorite blog posts and Facebook items over the past year. 1. Blue & White Delftware is Still a Delight! I talked about the history of Delft ware, the classic blue and white ceramics, and also about the evolution of polychrome ceramic ware from Holland. Did you know China influenced the evolution of Holland’s Delft designs as early as the 1600s? Here’s a beautiful example of classic Blue Delft for you to enjoy. When Greg and I decided to start a video blog on YouTube, we weren’t sure what to expect. A year later, with over 16,000 views of our videos, we consider the experiment a success! For items on our website with video descriptions, you’ll find a video embedded directly on the item page. You also can feel free to browse and subscribe to our YouTube channel to get notified instantly when we post something new. This video about how Greg and I met and how EuroLux Antiques came to be garnered over 10,000 views! People always ask us where we get our fine French antique furniture and other items. We feel we have an advantage in that Greg and I actually lived in Europe for several years, so we know the ins and outs of finding great items. Our methodology is a lot like what you see Mike and Frank doing on American Pickers: We rent a van and drive around Europe, entering people’s houses and buying directly from them. But we also seek out the better street markets. This blog post includes a video that shows how we do what we do. Why did Greg and I become antiques dealers? Because we love history. We have a passion for it. And sometimes that means taking the ugly with the beautiful. On the tenth day of our spring antiques buying trip, we visited the fully intact Nazi work camp in Breendonk, Belgium. We found it an eerie place. Our trip to Breendonk was emotional, and we captured the experience on video, which is embedded in the post. On a much lighter note, in June 2012 we began chronicling our adventures in renovating a ramshackle 1920s bungalow here in Newberry, South Carolina. This blog post marks our fist in the Vintage Life series, which has been very popular with our readers. Regular readers know Greg and I love pets. Our own fuzzy family numbers eight so far! This photo of two of our gallery cats wishing everyone a “fuzzy weekend” captured everyone’s heart on Facebook. We have discovered DIY home renovation isn’t for the faint of heart. So far, Greg has suffered a pair of broken ribs, while I’ve endured nasty bruises. Scorecard: Bungalow 2, Greg & Aimee: 0. Back at Facebook, our most popular post of 2012 was this one, which linked to our blog post on 2013 decorating trends. I talked about House Beautiful magazine’s Top 10 Trends, plus what the renowned Boston Design Center had to say on the topic. We’re just getting started on Pinterest, that addictive little site that lets you create virtual bulletin boards of all your favorite things. From recipes to design ideas, you’ll find tons of inspiration on Pinterest. 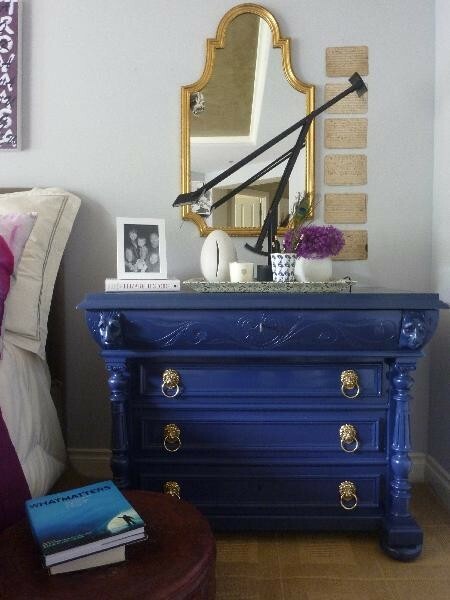 This painted cabinet garnered over 20 “re-pins” by admirers. Beginning in November, I revamped the blog to include more inspiration and information on living the vintage lifestyle. This post with ideas for decorating your cottage, Victorian, or city house seemed to strike a chord with readers. One of our most popular Facebook posts of the year was this link to our blog post about how to buy fine antique furniture online without fear. Some people think it’s crazy to buy antique furniture over the internet, but our informational post about how to vet a seller and what questions to ask proved to be a hit with our Facebook fans! Greg and I love traveling to Europe to meet wonderful people, buy antiques, and bring them home for you to enjoy. But we also love the day we fly home and reunite with Greg’s parents and our fuzzy family of eight. Nothing compares to the unconditional love of a pet, which is why we donate a portion of all sales to PETS, Inc. Here, Greg and Rudy get reacquainted after our buying trip. We hope your 2012 was filled with dazzling highlights of life at its best, and we wish you a beautiful and happy 2013 going forward! Thanks for being our clients and friends. 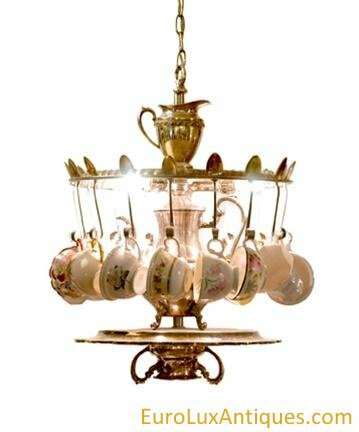 This entry was posted in News on December 31, 2012 by euroluxantiques. 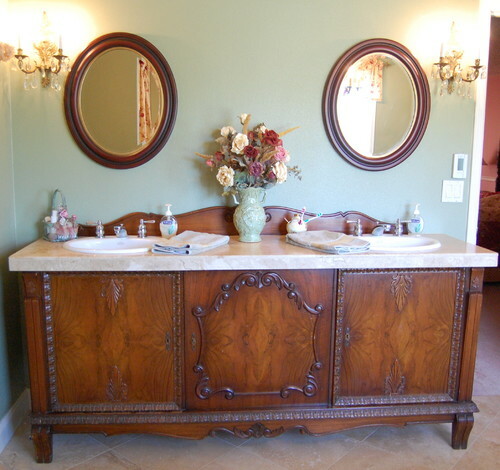 I love how creative our customers get when decorating with antiques! This pair of photos from Julie F. in Marquette, Michigan, is a great example. Julie picked up a Blue Delft garniture clock set that dates to 1890. I was thrilled when we discovered it was in working condition. The garniture candleabra add a romantic touch. I love how Julie displays this antique garniture set on her wood slab mantel against a stone fireplace. The contrast between the rustic backdrop and the fine Blue Delft looks amazing, don’t you think? Julie also made creative use of a vintage 1920 German lithograph by hanging it above the headboard of her antique brass bed. The lithograph not only adds some color and provides a focal point on the wall, but it provides an authentic antique feel to this room, as if you’re stepping back in time when you enter. Very nicely done! The theme of this lithograph is so appropriate for a bedroom: a night scene with a napping woman and cherubs. How sweet! I’d love to see your photos, too. Feel free to e-mail me pictures of creative ways you use antiques in your decor, and we’ll try to feature you here on the blog. Share your decorating skills with us! Wishing you a happy and peaceful holiday season from everyone here at EuroLux. This entry was posted in Client Spotlight and tagged Blue Delft garniture clock set, brass bed, cherubs, creative home decorating, design ideas, German lithograph, home decorating, Michigan on December 24, 2012 by euroluxantiques. We’ve been cleaning up the yard around our 1920s bungalow, and had always planned to tear down the ramshackle garage/workshop (and *literally* half a bath) built by the former owner. We knew it was full of mold, so it didn’t surprise us when it turned out to be full of termites too. Below is a view of the side of the back of the house. We added the door in what used to be the pantry (and was probably originally the back porch). That will now be the entrance to the mud room (off the kitchen) from the garage, which will be built where you’re standing. The rest of the ramshackle garage/workshop will be torn down, and then we’ll build a large bedroom addition in that space. You’ll never guess what was *under* the concrete slab. No, not a dead body. Give up? This entry was posted in Vintage Life: Our 1920s Bungalow and tagged 1920 Bungalow Renovation, Demolition, Vintage Life on December 17, 2012 by euroluxantiques.